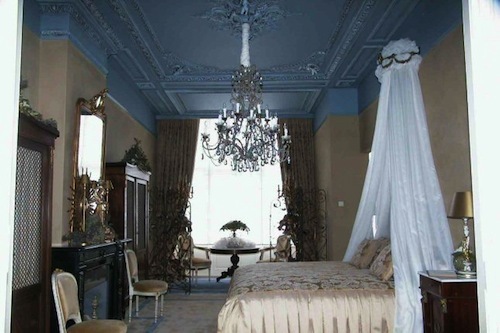 If you are looking for an opulent, intimate place to stay in The Hague, look no further than the Haagsche Suites, a 3-suite guesthouse owned by Guido van den Elshout. Set in a meticulously restored historic townhouse, the B&B features traditional design mixed with modern sophisticated touches. The individually decorated suites are spacious (75 square metres) and luxurious, with antiques, large beds and chandeliers, cozy fabrics and blankets, and views onto an exquisite garden. Each suite can serve as a bridal suite, but don’t think that this is only for couples. Haagsche Suites is ideal for business people and leisure travelers who need to be in The Hague, but want to avoid chain hotels and impersonal service. Indeed, one of the most wonderful things about Haagsche Suites is Guido’s attention to the needs of his guests. The city center is only a 20-minute walk (or 7 minutes by tram). Haagsche Suites will also provide you with bikes if you prefer to get around the way the locals do. Going to the beach by bike is perfect: Scheveningen is close by and parking at the beach is expensive and during the summer, nearly impossible. Breakfasts are a gourmet affair: fresh fruit salad, delicious croissants and pastries, fresh fruit juice, and a quiet relaxing atmosphere to savour the start of the day. You can also have Haagsche Suites organize a brunch, lunch or private dinner in the dining room for 4 to 8 persons. In addition, They can arrange catering for business meetings. Haagsche Suites’ owner Guido van den Elshout writes a popular blog called The Happy Hotelier, where you can find out more about him, his favorite hotels and travel tips around the world. Three years ago, he interviewed me for his blog: 10 Questions for Esme Vos of Mapplr.